Winter is a time when your horse will expend more energy to keep warm. How you assist him with this will vary with your local conditions, but there are a few simple things you can do wherever you have a definite “winter” season. If your horse is still reluctant to drink during the cold weather you can add celery seeds to his feed to encourage your horse to drink more. It is also a good winter supplement as a digestive tonic and assisting with stiffness from arthritic joints in older horses. A long coat is the horses first line of defence against cold weather. If a horse is rugged or blanketed or kept in a warm barn, he will not grow an adequate length of coat to protect him against the elements. If given the opportunity horses will huddle together and run around to keep warm . Care does have to be taken if your horse has come from a warmer climate and not yet acclimatised or if he gets wet. A wet coat will make it more difficult to stay warm and maintain comfort. To warm your horse from the inside out, Ginger is my favourite wintertime herb. It brings warmth to both you and your horse when given in feed to warm the gut, and generate warmth that permeates throughout the body. Ginger is also indicated for most illnesses that can be traced back to exposure to a draft or coldness in the body, any respiratory tract imbalance, to musculoskeletal issues. Fenugreek seeds help keep condition on a horse. They are an appetite stimulant as well as well as helping with any imbalance in the respiratory tract. You only need to add a tablespoon of fenugreek seeds to a feed, however as the seeds are difficult to digest unassisted, steep the seeds in boiling water to soften before adding the seeds and the water to your horse’s feed. Chamomile is another herb that helps with condition. It helps regulate the immune system in a gentle way, however when it comes to body condition it supports the muscles in the body. Your horse will appreciate the scent of aromatherapy if stabled in a closed environment. They help cheer up the barn sour horse and also act as negative ion generators to inhibit the spread of airborne pathogens. Grapefruit essential oil is referred to as “brain sunshine” and simply wafting the uncapped bottle under your horse’s nose will lift his spirits. Eucalyptus and Bergamot are antiviral and can be used in the same way to help build your horse’s resistance to ‘cold’ viruses. The herb rosehip, when added to the feed of a stabled horse will also help to build his resistance to disease and improve recovery time after illness that may have been your reason for accommodating him in a barn. 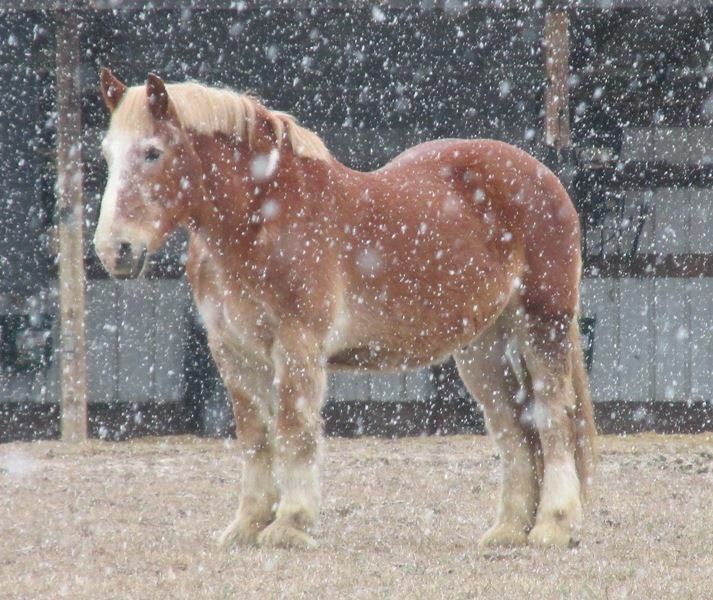 When working horses in cold weather, warm horses up slowly before asking for serious work. It would also be of benefit to both yourself and your horse to give your horse a good brisk massage to warm you both up before even saddling. Sweeping effleurage and circular frictions will generate heat and warm up the muscles. Most importantly when you are finished and unsaddled dry your horse off. Your horse needs to be cooled down thoroughly and brushed to stand the hair up so the fluffy hair traps air and keeps your horse warm Flat wet hair clings to the body and lets body heat escape. One first aid remedy to have handy throughout winter at the first sign of any illness is the biochemic tissue salt Ferr Phos. Remembering the importance of veterinary care, this tissue salt can be administered easily and quickly directly into the mouth at the first sign of fever or runny nose. Garlic is another preventative herb and a tablespoon every second day is enough to bolster the immune system through the colder months, and Echinacea root brewed into a decoction is often good to start your horses on, especially if your horse is new to a cold environment or had a history of respiratory complaints. Other herbs useful during the winter months are Nettles, Yarrow and Hawthorn Leaf as they improve the circulation to the most parts of the body and provide extra nutritional basics. During the colder months respiratory tract infections tend to be an issue. Herbs such as Elder, Yarrow, Elecampane and Mullein, Echinacea, and Astragalus are all herbs you need to know how to get hold of if your horse needs this sort of support. Elder flowers contain tannins and mucilage which are very soothing to irritated mucosal tissue. Elecampane and Mullein are two herbs to consider if your horse is afflicted with a cough. Elecampane while it soothes the respiratory tract also strengthens its ability to eliminate congestion from the lungs. It is very useful for the horse who is irritated by dust in their feed. Mullein is more for the wet coughs, where there is persistent dampness, or where your horse may be sore and irritated in the respiratory tract. Yarrow helps to dilate the peripheral blood vessels that become contracted in the cold, to assist the body to maintain a healthy warmth as well help address mild fevers or minor circulatory congestion. If your horse has been unfortunate and fallen to an illness during the colder months you can use herbs to rebuild his immune system and strengthen him for the coming year. Astragalus is a herb that will help strengthen the whole body, and another that is becoming popular is the Bulgarian grown Tribulus. Using either of these herbs or combining them with traditional western herbs such as Licorice will help your horse recover with more strength from within. If this is an approach you need, find a herbalist who can supply you with a blend of the liquid extracts. The most effective use of herbs with horses is simple and usually three or four herbs in a daily regimen will combine with a nice synergy to help your horse overcome most obstacles the cold weather creates within the body. No matter where you are in the world, the winter months can be a little wearing on the rider, especially when it comes time to get out of bed in the dark to get to your horse and stables, or to go down after a day’s work in the dark, or to try to be cheerful with icy cold hands and feet. One of the best ways to stay warm in winter is by warming yourself from the inside. Brew up a warming tea of ginger, peppermint and elder flowers and take it with you to sip throughout the day. It will stay warm for hours in a well-managed thermos. In the evening, you can make your own mulled wine – add a variation of herbs such as the sweet and fragrant mix of whole pieces of allspice, cassia, nutmeg, ginger, cinnamon, mandarin peel and cloves to a red wine. Combine the spices and citrus in red wine or a non-alcoholic beverage. Sweeten to taste (up to 1/4 cup sugar). Heat this through for at least 15 minutes, but don’t boil. Also carry a magic tissue with you throughout the day. The scent of essential oils added to a tissue can help create a barrier by acting like a personal negative ion generator, making it more difficult for viruses to pass through the air and make contact with you. Bergamot is particularly effective if there is a viral infection going around your area and you have to travel to and from work or the stables on public transport. One old remedy to mix up, if you feel the beginnings of a cold or flu coming on, is this juice. Be warned it is for the heroic ones amongst us, but when I have been brave enough to cook up the ingredients, it has always helped push the bugs out of my system. For those of you less brave, a simple Thai or Indian curry will suffice. I like this option as it soothes my digestion as well as my soul when I am feeling vulnerable to all the bacteria and viruses waiting out there to take advantage in the cold weather. It follows loosely on from the use of composition powder by the physiomedical herbalist Samuel Thompson. He formulated this blend of herbs in 1846 and it contains barberry bark, ginger, cayenne, cinnamon, prickly ash bark, and cloves. It also makes an enlivening additive to soups during winter. Simply add anywhere from a teaspoon to a tablespoon depending on the size of your pot, and enjoy. Marjoram is a warming essential oil and very sedative. It can be a useful one to inhale as you drift off to sleep, to help you let go of the worries of the day. If your body clock has trouble adjusting to the shorter days during winter, supplementing low doses of chaste tree berry (Vitex agnus castus) helps the body with the manufacture of its own melatonin and enables the body to readjust quickly. Taking a small dose before bed for a week or so should be sufficient to assist you. Do not take this herb if you are taking hormone replacement therapy. Most nasty bugs that thrive during winter thrive on cold, while the human body becomes more vulnerable when it is cold. Wear plenty of layers and keep your body warm so there is less opportunity for viruses and bacteria to invade your personal space. During the shorter, damper days, the essential oil of grapefruit is considered a little drop of brain sunshine. When you first get into your morning shower, cover the drain hole with your foot, and simply drop three or four drops of this essential oil into the pooling water. This will help lift any dampened mood and start your day with a special brightness that will help you deal with any unwanted exposures – thoughts, pathogens, or otherwise.